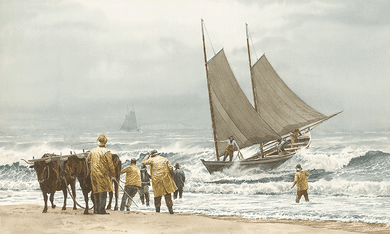 Victor Mays Open Edition Gallery Wrap Canvas Giclee:"Block Island Boat Beaching"
About the Art: Twelve miles out in the Atlantic, off the coast of Rhode Island, Block Island was settled in 1661 by hardy colonists who wrested a living from the glacial soil and surrounding sea. The Block Island boat or "cowhorn" evolved out of the need for a staunch, seaworthy craft for fishing the rough waters and commerce with the mainland. Double-ended and simply rigged, cowhorns ranged in size from 18 to 40 feet. They could be rowed in a calm and were ballasted with cobblestones that were plentiful on the island. In their long history, only one cowhorn was lost, according to local lore. Before the breakwaters were built in the later 1800s providing protected anchorage at Old Harbor, the Block Island boats were beached with the aid of neighbors, oxen and skids. Here a large cowhorn surges in on a comber while a sister boat offshore runs home on a stiffening nor'easter.